Unmanned cargo robots in the air, on the ground and at the sea can dramatically reduce cost of logistics worldwide and increase efficiency for industrial users and end customers. While PwC have estimated addressable market size for airborne drones alone to be $127 bn.1, the current industry limitations including lack of stable credit, costly insurance and near-prohibitive regulations in some countries do not allow it to realize its full potential. Currently, this industry exists in form of feasibility studies carried out by large corporations or startups. SKYFchain Operating Platform (hereinafter SKYFchain OP) is the first B2R (business-to-robots) blockchain based operating platform applicable globally in all sectors of a developing cargo robotics industry. It will be initially developed and tested by using the first industrial cargo airborne robot –SKYF drone –which will also give SKYFchain instant access to its client base for development of unmanned business processes. 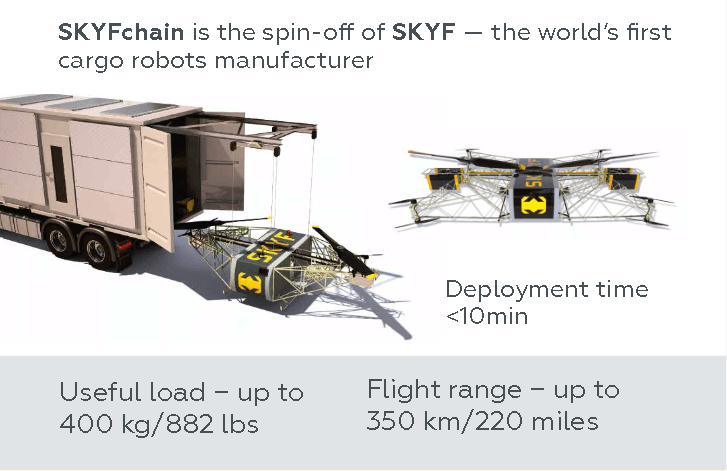 Later all other unmanned cargo systems: in the air, on the ground and at the sea will be connected to SKYFchain. SKYFchain as a blockchain with built-in smart contracts will provide trusted source of data and reasonable control over unmanned assets for clients, logistics operators, insurance and leasing companies, banks, and authorities worldwide. It will unveil new profitable business opportunities for all industry participants, transportation system with lower risk for the society, and increased overall affordability of goods and services due to substantial cost cutting in the global supply chain. During ICO we will issue 1200000000 SKYFT tokens, which will be used in SKYFchain to facilitate all internal transactions. 1.More and more companies, clients, financial institutions will be connected to SKYFchain which will drive the growth of transactions in SKYFchain and demand on SKYFT. 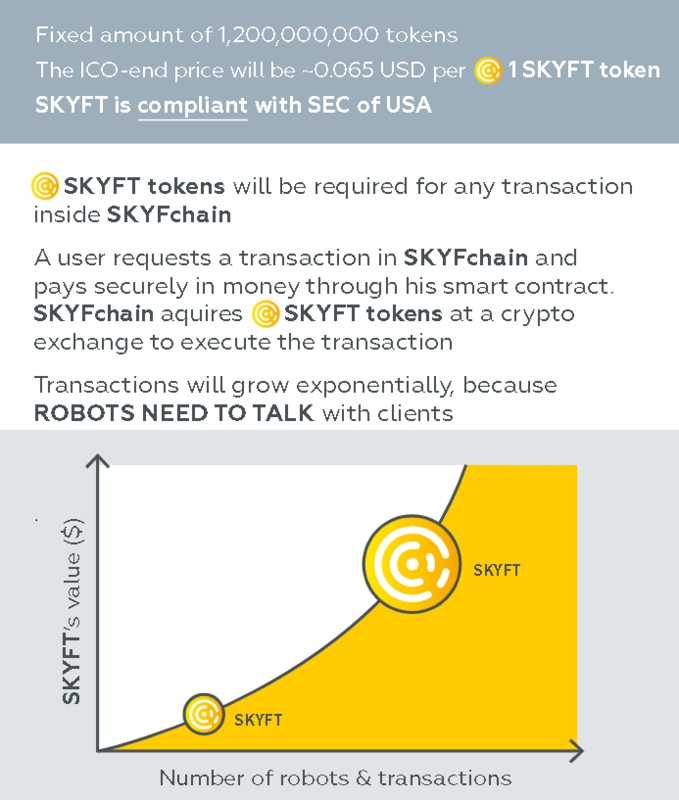 2.For every SKYFchain transaction whether it’s getting loan to buy unmanned vehicle, client payment or something else SKYFchain will charge some commission. 25%of commissions will go to SKYFT holders. ➢SKYFchain legal entity -Skyfdrones Services OU -is registered in Estonia which has one of most favorable regulations in the world for blockchain related companies. ➢SKYFTtokens are compliant with SEC of USA and available for US investors. ➢Hundreds of SKYF drones will use SKYFchain as an operating platform. SKYFchain developers will have direct access to all SKYF drone clients to test and polish SKYFchain system before inviting other producers of drones to use the system. ➢SKYFchain is aspin-off of SKYF drone development project, which in addition to granting SKYFchain access to clients shall use 20% of revenues from sales of SKYF drones to purchase the SKYFT tokens from the market. We estimate that this may amount to$50M during the next 3-5 years after the ICO. And the SKYF drone is designed with full range of IP protection measures including patens and know-how. This shall protect SKYFchain uniqueness for the time of its initial development. ➢SKYFchain has very experienced and trusted team of engineers and business leaders with proven results–they have attracted $5M of VC money into the SKYF drone project.